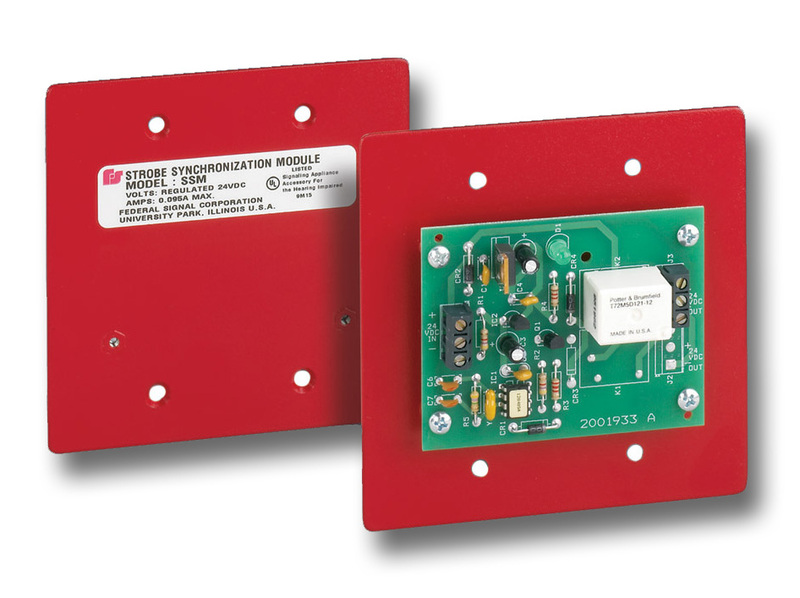 The Model SSM, Synchronous Strobe Module, is an electronic timing mechanism designed to energize select Federal Signal low in-rush 24VDC strobe lights simultaneously while maintaining the ability to remotely supervise the strobe light circuit. The Model SSM, Synchronous Strobe Module is an electronic timing mechanism designed to energize select Federal Signal low in-rush 24VDC strobe lights simultaneously, while maintaining the ability to remotely supervise the strobe light circuit. This module is designed to synchronize a special series of Federal Signal strobe lights, which meet the requirement for Private-Mode Fire Alarm use, while maintaining the agency approval and environmental rating of the strobe light. The SSM is only compatible with Federal Signal brand strobe lights. See compatible models on the Specs page. The SSM enables the customer to meet local building codes through a visually appealing single-flash created by the simultaneous control of strobe lights connected to it. Mixed signals are reduced to a minimum as the reflection of many light pulses are now viewed as one single flash. The SSM mounts to the plaster ring of a double-gang electrical box and requires 24 VDC at all times to operate the timing circuit. Screw terminals are provided for field termination of control wiring and a maximum of three non-explosion-proof strobe lights or two explosion-proof strobe lights may be connected to each SSM. Electrically, the SSM should be mounted in the middle of the circuit, with a maximum cable distance of 100 feet from the SSM to each Strobe light. Supervision is accomplished the same as without the SSM, with a flash rate of 72 Flashes per minute in lieu of the advertised flash rate for each strobe light. The SSM is capable of switching 6 Amps of current. Please note: Not all strobe lights have the same in-rush current and therefore the SSM's circuit's switching potential may be reduced.